In 2013, Hayao Miyazaki retired from making feature films. This year, it was officially announced that he was returning to long-form filmmaking. And now, we know why. When he retired from features, Miyazaki cited several reasons why he was stepping down, including that his vision was getting worse. “If I said I wanted to [make a feature film], I would sound like an old man saying something foolish,” Miyazaki said at the time. Now, Miyazaki is hard at work on a new feature. But why? What’s the reason he came back? 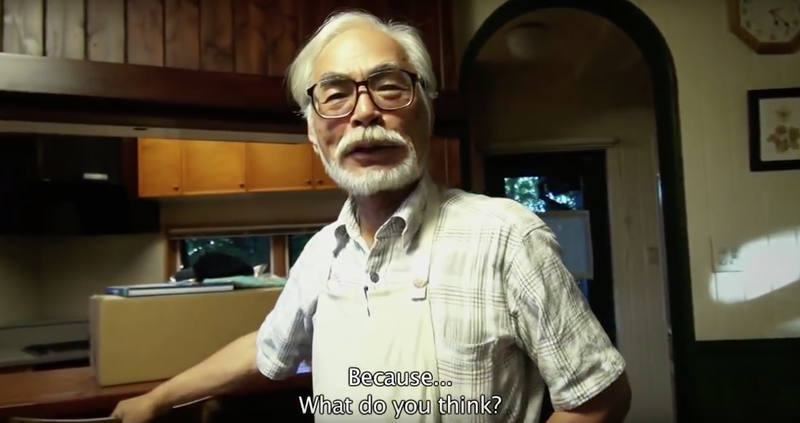 According to his long-time producer Toshio Suzuki, Miyazaki came out of retirement for his grandson. According to Shukan Josei Prime, when Suzuki was recently on NHK television program Nichiyobi Bijitsukan (Sunday Art Gallery), he explained Miyazaki’s motivation. Suzuki added, “No doubt Ghibli fans are looking at the TV, blurting, ‘Hey! Wait a second. That’s the reason? !” That is, it seems, the reason.